New Kitchen Tricks That Make ME Happy! “If somebody ever tells you that you put too much parmesan cheese on your pasta never talk to them again. I’m always looking for interesting ways to cook since I cook 5-6 nights out of the week and today I took a risk with two dishes using new to me techniques and I must say with fabulous results. The first was a reverse sear method that I have wanted to try, risking a very nice boneless thick chop to begin with (not my favorite) as well as a new pan sauce method just slightly adapted. The second/3rd recipe was a boy do I love me some cacio de pepe which can be a tad tricky, but not with Kenji’s method, delicious. Kenji’s tricks can be found at Serious Eats and I hear that he has a new book out at this time, but I like to try out things before buying the big book. So far I am a fan of the reverse sear and will be trying that again on other cuts of meat so I’ll link to a couple of them so I don’t mess things up since I tend to stray a bit from some recipes. In this case I dry brined the thick chops overnight with an easy blend of salt, sugar, pepper and ground mustard seeds. 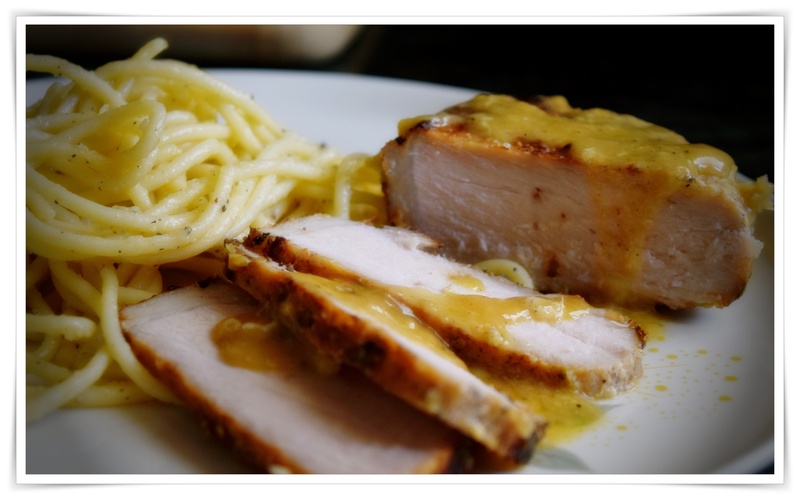 The lengthy article goes into great depth and from there links to just the chops recipe and to go a step further I read up on his pan sauce method with the surprise ingredient of gelatin, interesting and for my pork I made a simple white wine, lemon, butter and stock version, delicious.